Most folks go there to either buy or sell. I go for peace and joy. The Farmers Produce Auction west of Mt. Hope, Ohio is heaven on earth for me. Given the size of the crowds and the non-stop activity, I have a feeling I’m not alone in that sentiment. This little spot of paradise, located dead-center in the prettiest township in Ohio, bustles with business. That’s especially true in fall, the summit of the harvest season. That it is so raucous this time of year should come as no surprise. The skid loaders, the bins, the baskets, the boxes, the trucks, the wagons, the carts, the pallets overflow with all of Creation’s botanical creativity. Though they may not look like it, the auction grounds and buildings are the Garden of Eden April to November. Fall is its horn of plenty. 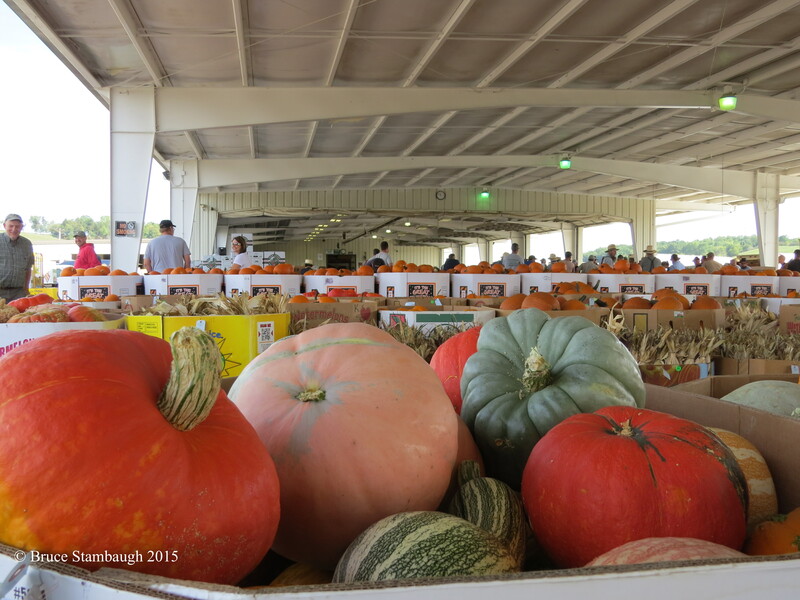 Growers of all delicious fruits and vegetables and eye candy fall flowers gather their goods and come to the auction. 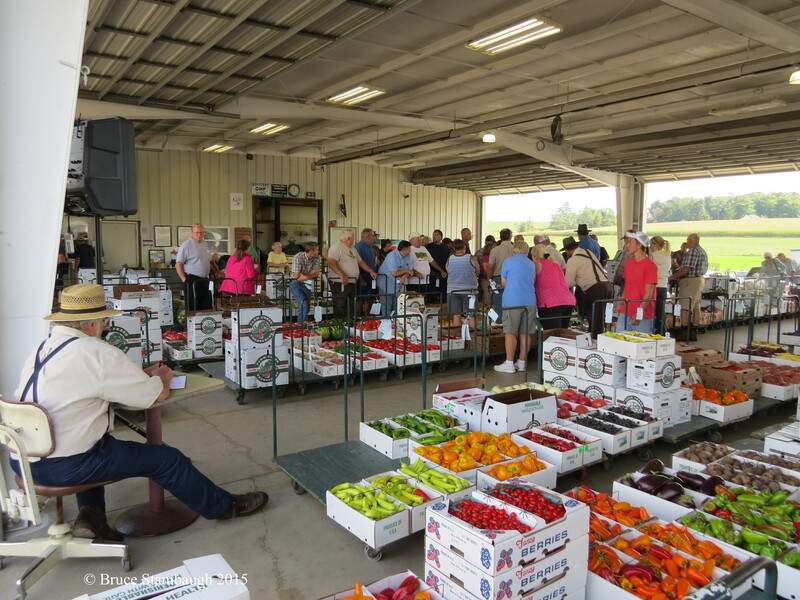 As diverse as the produce varieties, attendees represent a microcosm of society. Men, women, children, black, brown, white, young, old and in between, workers, buyers, sellers and admirers harmoniously intermingle. Once the auctioneers’ voices begin to resound, all eyes and ears swivel to attention. Buyers from small urban markets, major grocery stores, and mom and pop stands along country roads stay glued to the rhythmical cadence of the hucksters. They want to make sure they’re going to get the best produce for the best possible price. They know what their customers want and what they’ll pay for quality fresh food and flowers. It’s entrepreneurship at its finest. Finer still is the paint pallet of colors of the gourds, squash, pumpkins, mums, watermelon, tomatoes, plums, apples and cucumbers. Together they create a biological masterpiece. I wander through the grounds absorbing this end of the rainbow experience. The raw aromas of the fruits and veggies mingle with those of the resting horses and the scrumptious offerings of the beckoning lunch stand. As if this ever-changing live landscape painting weren’t enough, the singsong crackle of the auctioneers’ voices over the loudspeakers lead the melody of the moment. The hum of the electric loaders, the dozens of sidebar conversations, and the hailing of one person to another across the way sing in harmony. I glide through as those around me keep to their appointed tasks of loading and unloading, of buying and selling. I am unhindered as I zigzag my way up and down the aisles careful not to interfere or offend. When I stop and admire the artistry in the earthiness of the individual brush strokes of this organic collage, I come alive. I am at peace. I find joy in the natural patterns of the speckled, striped, plump, oblong, elongated brightness nestled in this temporary harvest home. The scene could be a Monet or a Rockwell with one exception. It’s real, and it’s all around me, intoxicating all who partake. Once the bidding ends, a patented rush begins in two directions. One is to quickly but carefully load the delivery trucks to ensure freshness to the awaiting customers miles away. The other is to the food stand, where the chefs are generous with their portions and their geniality. From still life to landscape to abstract renderings, this produce market offers much more than edibles. In the course of the procurement, peace and joy surreptitiously enrich the colorful treats. 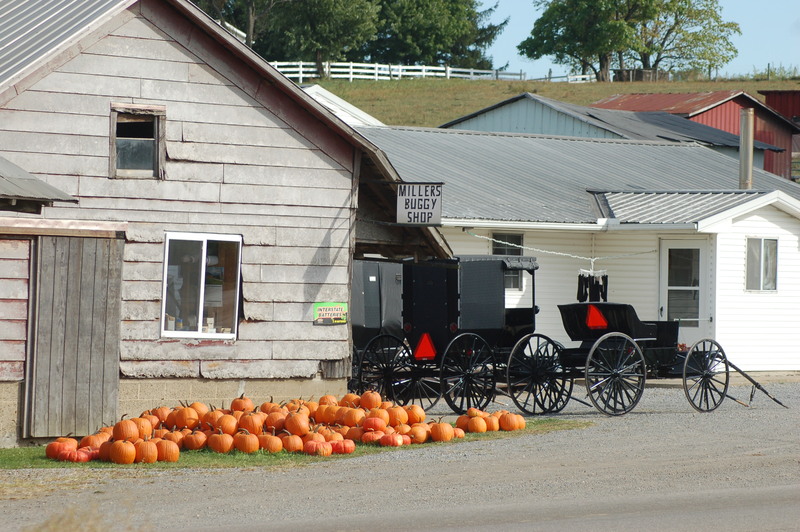 Scenes such as these make iconic Amish country photographs. However, fields of shocked grain like this are less and less frequent. 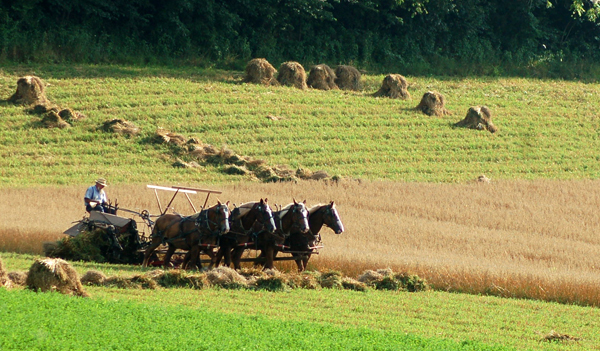 Rules for the Amish farmers are changing, allowing them to make use of equipment like combines to harvest oats and wheat. Only the lower order Amish still shock wheat and oats. This method permits the grain to dry in the warm, often hot, August sun. Once the moisture content is low enough, the shocks are pitchforked onto a wagon and hauled to the barn. There a thrasher separates the grain from the chaff. I hope this process remains, if only for its marvelous beauty. 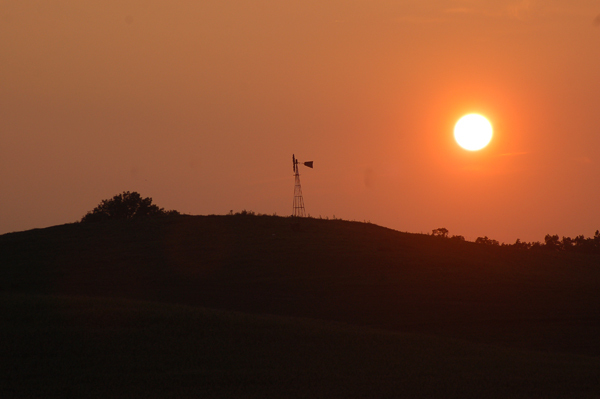 “August in Amish country” is my Photo of the Week. Officially it’s still summer for a few more days. Reality says otherwise. Fall is upon us. The signs are everywhere. They have been for sometime now. 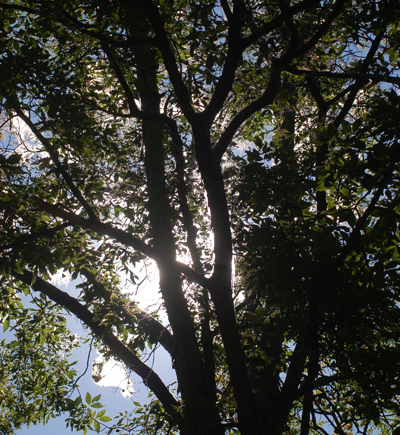 Warm, pleasant days give way to cooler, quiet evenings. Only a few remaining crickets and an occasional Screech Owl break the night’s silence. 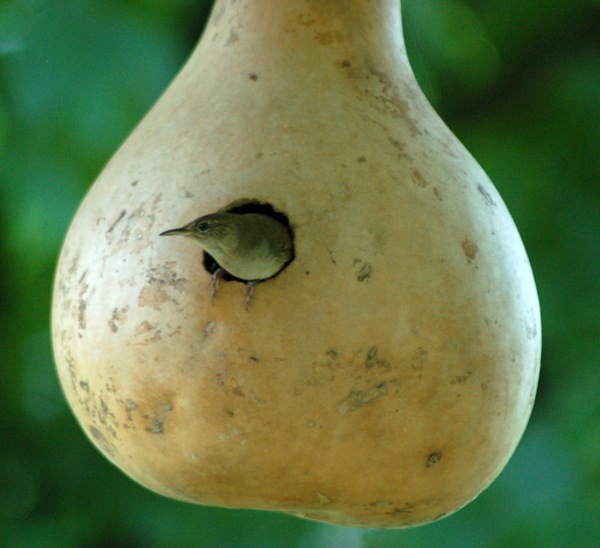 The morning wake up call suddenly switched from a chorus of American Robins to cheery Carolina Wrens. The effect is still the same. Dense fog quickly lifts from valleys, giving way to white cottony clouds highlighted pink, peach, gold and gray by the strengthening sun. 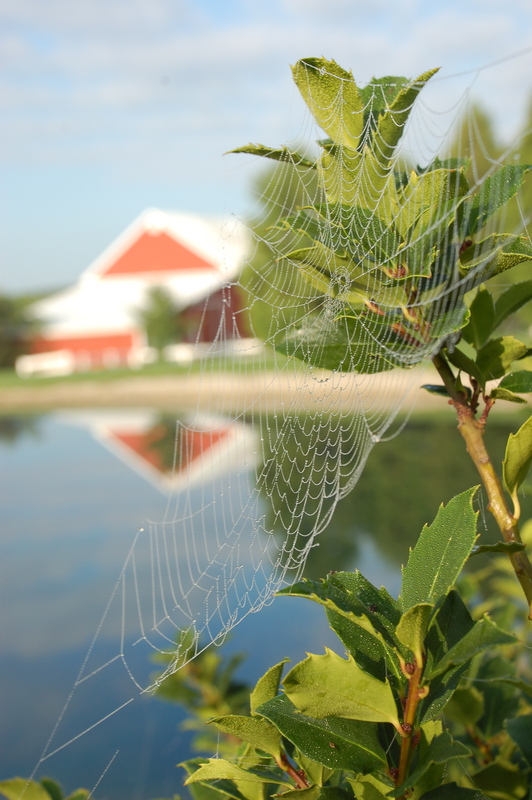 Morning mists betray the garden spiders’ artsy trap. The miniature droplets soon yield to the day’s brightening warmth. 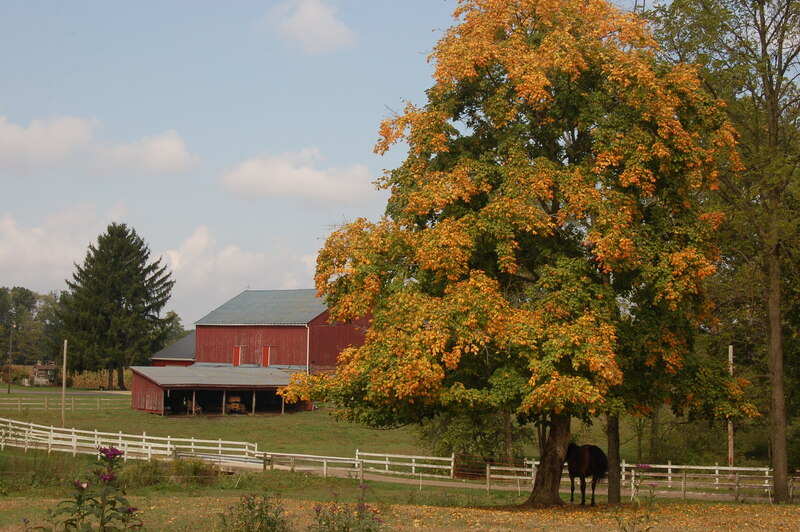 While most show a slight tinge, some entire trees have already had their leaves turn a dull orange or dirty yellow. No doubt the stress of this summer’s oppressive heat and extreme dryness forced this premature metamorphosis. Some leaves seemed to go green to brown overnight. The deepening blue sky offsets these anomalies, making them almost acceptable. Fall is not a time to quibble. It’s a time to appreciate, to work and to reorient yourself and the world as we have come to know it. Scholars head to school, each in their own way. Young boys, red and white lunch buckets swaying by their sides, walk in groups, tan straw hats bobbing rhythmically. Smart girls wearing pastel dresses glide by on mute bicycles. They left home later than yet arrived simultaneously with the boys. Bumblebee painted buses inch past the pedestrians until the next stop. 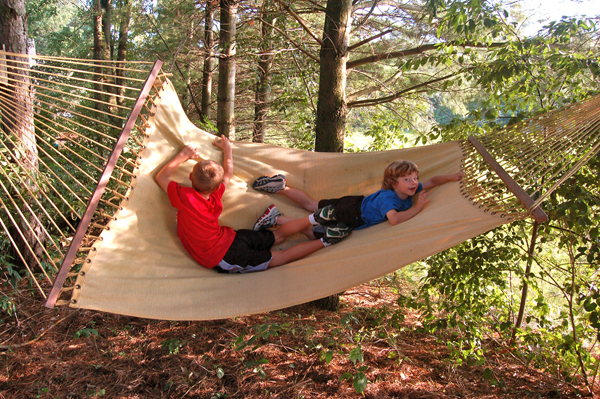 Somewhere behind sheer curtains, home-schooled children take it all in. The hum of school seems to settle society, put it back in sync. Family vacations end. The students, though not likely to admit it, enjoy the familiar routine, save for a handful of frequent flyers who already know the path to the principal’s office. At the produce market, giant pumpkins now outnumber the red, plump tomatoes and the ubiquitous zucchini. Despite the protests of the regal morning glories, crimson and gilded mums are the flowers of choice and the season. Despite the drought, farmers are smiling, assuming they indeed have crops to gather. They live for the harvest. Its their bread and butter, their paycheck, their livelihood. They relish the work and consider comparing their bushels per acre numbers as an exercise in status. If their neighbor needs help, however, they’ll be the first to respond. 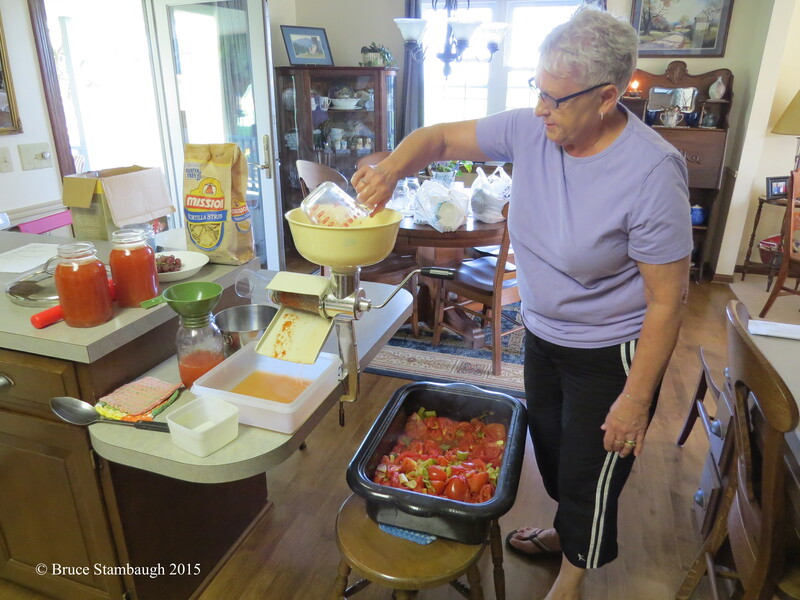 Kitchens fill with the aromas of snappy salsa, and pickles and vinegar. Canning shelves are replenished with jars of winking peaches and cherries, sandwiched by rows of golden corn and tart applesauce. 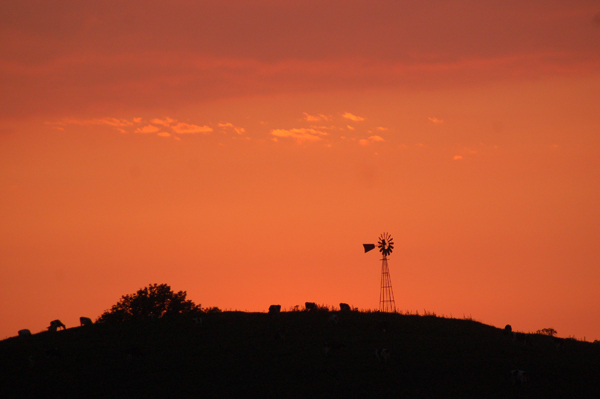 Life in the fall in the rural Midwest in mid-September is as fulfilling as it gets. Pride and gratitude are the human harvest for rural folks. No blue ribbons, even if bestowed, can provide the same satisfaction. Those ancillary awards politely confirm what we already believe. Where coloring stands of hardwoods mingle with fencerows and cornrows, life is good. We acknowledge our connection to creation and to one another. We also sense the real and urgent necessity to care for mother earth as we prepare for whatever winter brings our way. Fall is upon us. Stop, look, listen, inhale and enjoy. The rest of life will take care of itself. It is an equal opportunity seasonal transition we all need whether we know it or not. I humbly thank autumn for the abundant and timely cues. 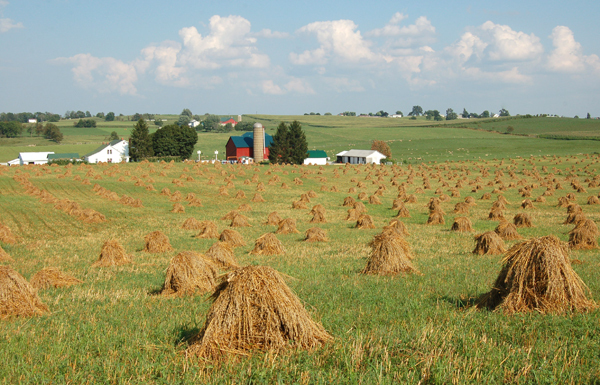 A field full of oats shocks before being gathered for the thrasher near Berlin, Ohio. With Labor Day upon us, autumn will be right around the corner. In fact, if you look closely, signs of fall are already evident. Some of the indicators are obvious, others more subtle. Some are predictable with still others seemingly a bit premature. The days, often the nicest of the summer, have a sly, natural flaw. Day by day, minutes of daylight are silently subtracted from the previous day’s total. By month’s end, daily darkness will outnumber daylight once again. The sun itself is moving more towards the center of the horizons at sunrise and sunset. Those driving true east and west running roads have already begun to frequently use their sun visors. 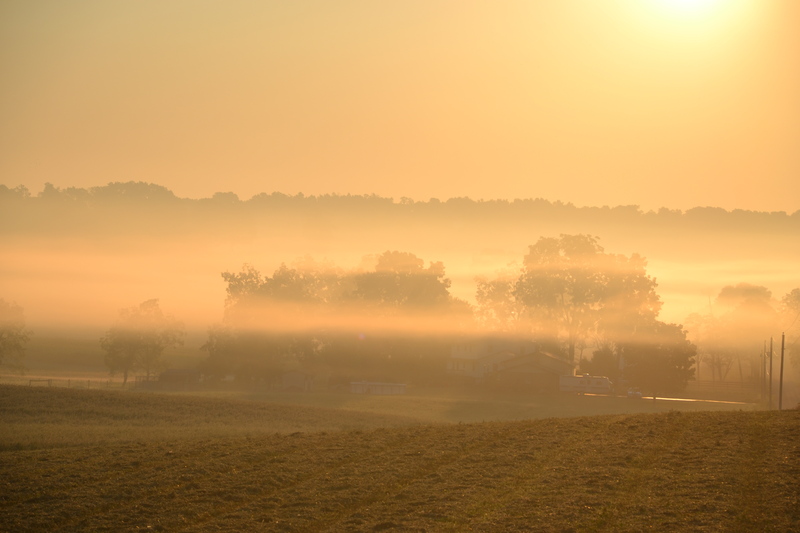 The fall fogs, too, have clouded crisp mornings, the consequence of cool nights following warm days. In the fields, the harvesting has begun. 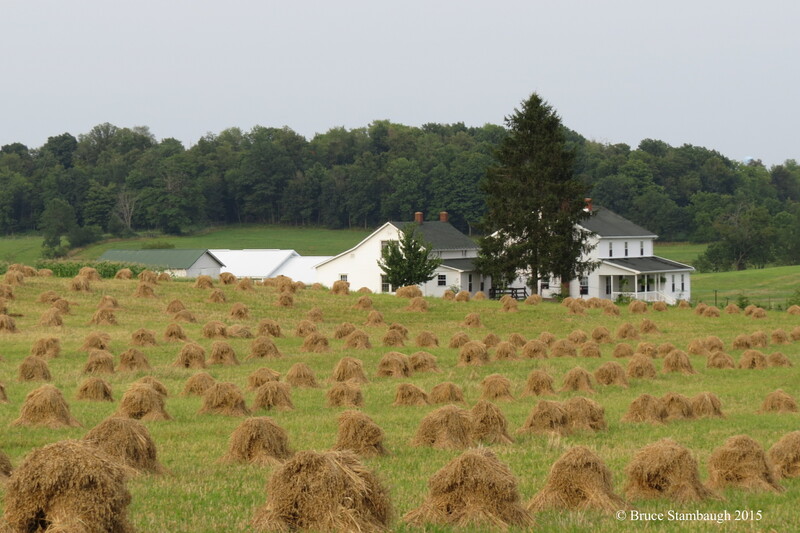 My Amish neighbors have long since gathered up the standing army of oats shocks and wheeled them off wagon load after wagon load to the thrasher. Now it’s the corn’s turn. The field corn seems to have taken on drought status, drying up almost overnight. Brown has overtaken green as the predominant color in the standing sea. 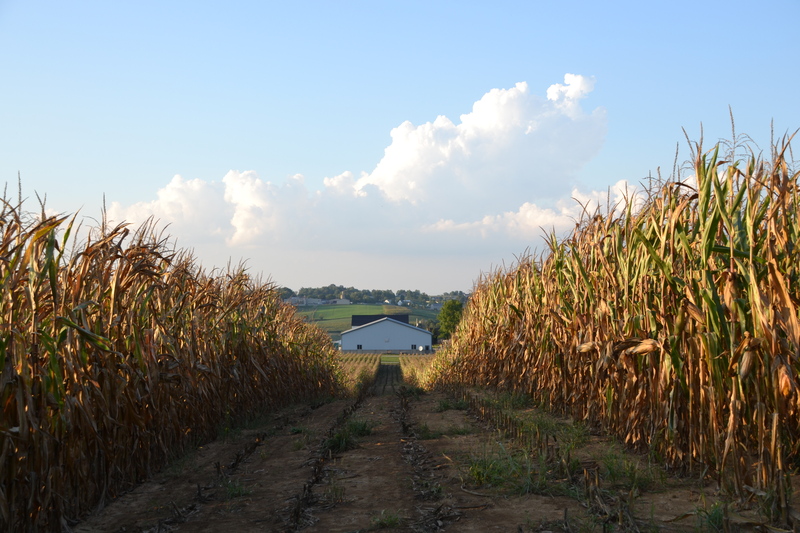 Smart farmers have already begun to cut their supply of silage to replenish the silos. The homes of fall webworms shine in the sun. In the woods and along highways, once glossy, emerald leaves have dulled and drooped. Some have already begun to drop without even changing color. Now and again a black walnut can be found standing stark naked, save for the cache of fall webworm nests it has involuntarily collected. In the gardens, the picking of produce is a daily chore. Cucumbers, onions and tomatoes have hit their peek. 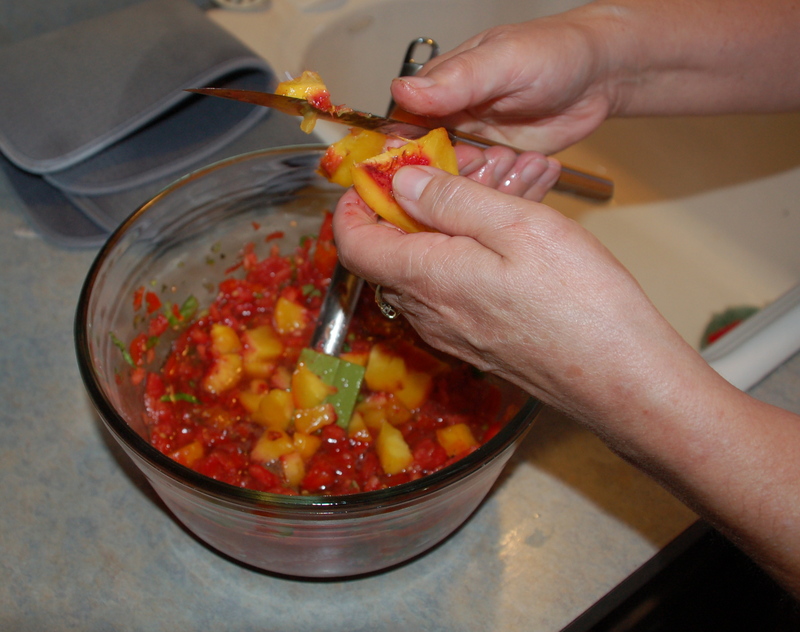 Kitchens are cluttered with utensils for canning and freezing. 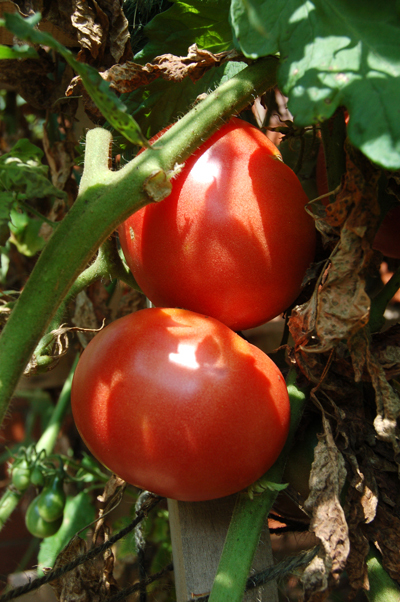 The ripened fruits and vegetables that aren’t consumed at the dinner table find their way into jars and containers. Even the sounds of the season have changed. Only a few American Robins continue to sing, and most likely they are sophomores practicing for next year’s prom. Instead of gathering nesting materials and snagging worms and insects, parent birds lead their fledglings to watering holes for liquid refreshment and necessary bathing. A well-worn tiger swallowtail butterfly took advantage of some wildflowers. The volume and frequency of the cicada and katydid songs have lessoned considerably. Even the crickets have quieted down. 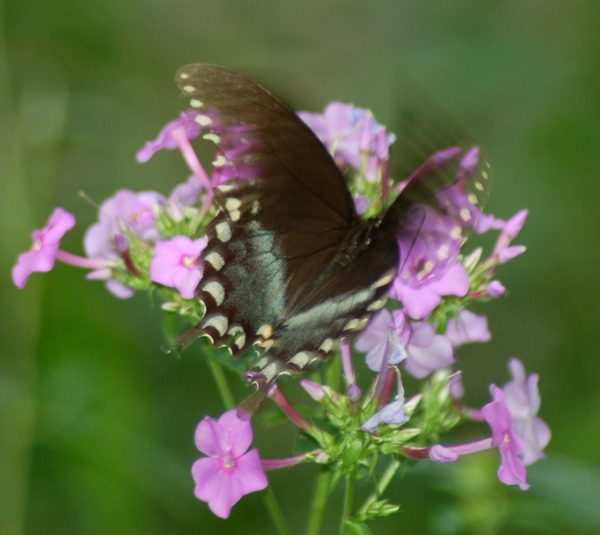 A butterfly enjoys late blooming phlox. 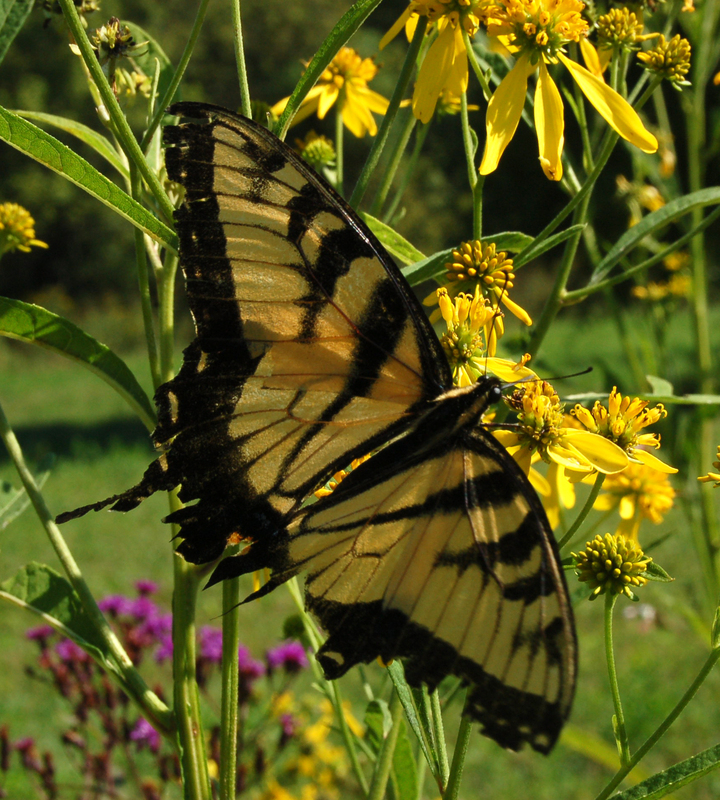 Butterflies of all sizes and colors squeeze whatever nutrients they can out of the fading cornflowers and black-eyed susans. The humming birds, too, seem to sense an urgency to store up extra energy for their upcoming southern vacation travel. Squirrels are in their glory, cutting as many beechnuts, hickory nuts and walnuts as they can. Thrifty creatures that they are, they also bury future meals for harder times ahead. Only they can’t always remember where they put their stash. Next spring, when the saplings begin to appear, we will learn just how forgetful the squirrels were. But between now and then, many pleasant days lay ahead, and probably some less than desirable ones, too. There is yet one more indicator that fall is knocking on our door. Campaign signs have already begun to litter urban, suburban and rural roadsides. They are as prolific and unsightly as the ugly webbed homes of the worms. The obnoxious yet gaudy campaign posters are a human-induced reminder of what nature is about to bring. Autumn will be here before we know it, and there is little we can do about it except to enjoy the ever-changing colorful show. Cows grazed on a hillside at sunset.